44/52 Les Winan Thoroughly unrealistic in a variety of ways. The movie tries too hard to go in multiple directions and gets lost each time. Very disappointing. 47/65 Kim Hollis A huge, whopping bummer of a movie. Bleh. 90/159 David Mumpower I love the cast and Casey Affleck is outstanding, but the movie doesn't have many selling points otherwise. 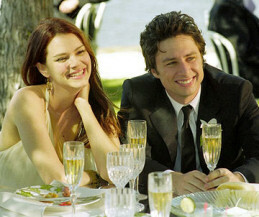 A remake of the Italian film L'Ultimo Bacio, The Last Kiss will star Zach Braff (Garden State) and one-time MTV Real World-er Jacinda Barrett as a co-habiting couple who could find themselves undone by questions of whether they are meant to really be together. Paul Haggis, who wrote the screenplay for the Academy Award winning Million Dollar Baby, will handle the scripting of the adaptation. The original Italian film was one of the highest grossing in its native country for the year 2000. Directed by Gabriele Muccino, it tells three interconnecting stories of three different generations who are trapped in varying situations. Various relationships are shown reaching crisis point. For example Carlo and Giulia have been living together happily for three years, but when Giulia happily discovers she is pregnant, Carlo panics. When he meets a beautiful 18-year-old college student, he becomes infatuated and pursues her for a final fling. At the same time, Giulia's mother finds herself impacted by the realization that she will be a grandmother, believing that her youth has suddenly passed her by. See the latest developments for this project on the The Last Kiss Movie News page.